Monoblock plants BIOTAL from 1.5 to 10 m3/day. 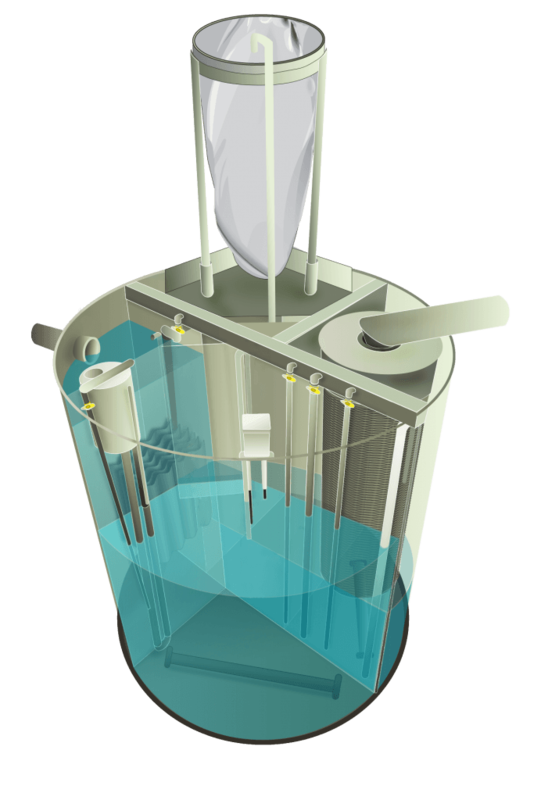 Monoblock plants are designed for deep biological treatment of domestic sewage with a volume from 1.5 to 10 m3/day. The cylindrical polypropylene bioreactor, divided into cleaning zones, is placed in an underground ferro-concrete well at a distance at least 5 m </ strong> from a residential building. The automatic control unit and the blower can be installed in an existing non-residential space, in a specially constructed room or in a box-recuperator, which is mounted in the ceiling of the well. The maximum distance from the blower room to the well with the BIOTAL plant should not exceed 20 meters. The following types of BIOTAL monoblock plants are manufactured – MPD, MPD-R, MPD-RB, MPD-B, MPD-BU, MPD-RBU. A detailed description of the types of BIOTAL plants is given in the relevant sections of the web-site. Please note! For BIOTAL monoblock plants, including automation and NITTO compressors warranty is 3 years.